Eduladder courses- Will there be any cost for online courses? Will there be any cost for online courses? 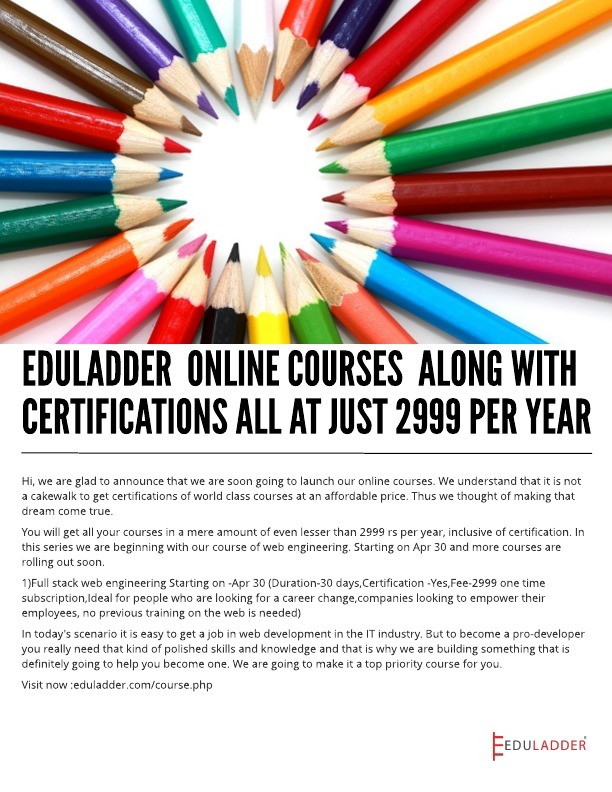 Yes, Eduladder Course is associated with a cost it will just cost you 2999/- Annually with that cost, you can study any course which is being thought with our platform. For example, if you paid 2999/- For a year subscription, you can select and study any courses which are being thought from us. Select Vedic maths or full stack engineering anything with the price of one. A teacher teaches 1 to 3 courses (subjects). Each course is taught by only one teacher. A student can take between 1 to 5 courses. A course can have 10 to 300 students. Illustrate with a suitable diagram how above scenario can be modeled in UML. Eduladder courses-Will there be any teachers or mentors who will teach? Is there free and certified online courses out there which enables me to earn while i am learning?